There are a few summer staples that happen every year. Roasted tomato salsa, grilled zucchini, and this fresh polenta. Traditionally, polenta is made from dried/stone-ground corn. This version relies on using fresh summer sweet corn. The texture is different but the flavor of the polenta is all summer warmth. I usually make the polenta base the same and it’s rare that I add cheese (but that is an option). The toppings, however, are anything goes. I like to pile high the summer vegetables and flavors. This sweet corn polenta version features one of my favorite toppings: fried eggs. The fried eggs in this recipe are my favorite: Pete and Gerry’s Organic Eggs. It’s been such a treat to work with them on a few recipes. As I’ve mentioned before, we use eggs so often in our house whether it’s for a simple breakfast scramble or egg salad for lunch. I know these eggs come from a company that works with small, family farms and cares about the environment. Cheese: melt your favorite cheese into the polenta. I like to keep the flavors pretty minimal but goat cheese is always a lovely option. I’ve also been known to sprinkle a bit of feta or blue cheese on top, with the tomato relish. Roasted Tomatoes: Sun-dried tomatoes aren’t for everyone so if that includes you, try using roasted cherry tomatoes in place of the sun-dried tomatoes. Different flavor but still delicious. Herbs: The relish is delicious with many different types of herbs. Chives, parsley, and thyme are a few other options. If it’s towards the end of summer and I’m craving a bit more fall, I cook a bit of garlic/rosemary together and add it to the mix. 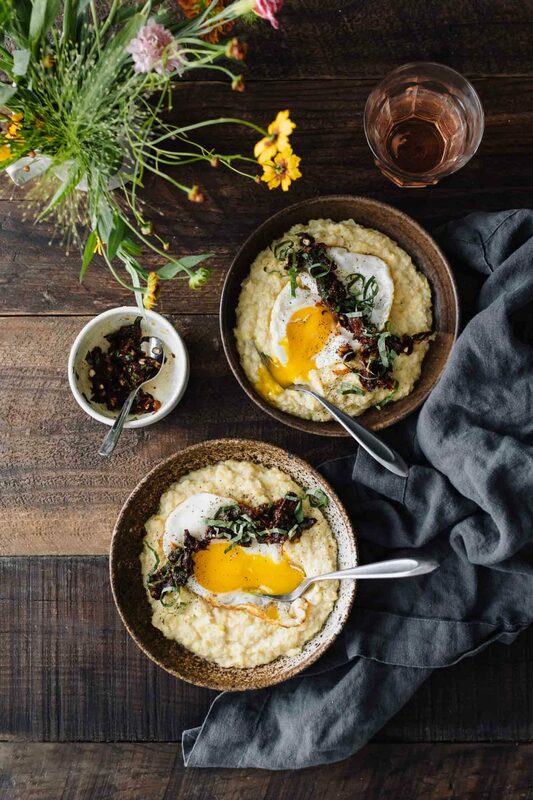 Creamy, fresh polenta made from only sweet corn and topped with a fried egg and an easy sun-dried tomato relish. Remove kernels from the cob. Keep cob to make stock, or discard. Place the corn kernels in a pot and cover with vegetable broth/water (or corn stock, if using), between 2 and 2 ½ cups. Add a generous pinch of salt. Bring to a boil, reduce to a simmer, and cook for 10 minutes. Transfer the corn kernels to a blender (high-speed is preferred), leaving any liquid behind in the pot. Puree, adding some of the water/broth as needed, until the kernels have broken down and the mixture is paste-like. Transfer the sweet corn back to the pan and stir in with the leftover liquid. Heat oven medium-low heat, stirring occasionally, until the mixture thickens into a polenta-like texture. Chop the sun-dried tomatoes and add to a bowl along with the garlic, basil, red pepper flakes, lemon juice, zest, salt, and pepper. If the mixture seems a bit dry, add a splash or two of olive oil. Divide the polenta into two bowls, top with the fried eggs, and add a few spoonfuls of the relish. To make the corn broth, use a ratio of is 1 cup of water for 1 cob. I like to make it in 8 cup batches and toss in a couple onions, a few cloves of garlic garlic, 4 to 5 sprigs of thyme, salt and pepper. This is also another recipe for broth that’s a bit more involved but also delicious. Disclosure: This recipe was created in partnership with Pete and Gerry’s Organic Eggs. All thoughts and opinions are my own. It’s content like this that helps me keep this site running to provide the vegetarian recipes you see every week.